Without doubt, Agra is a prime attraction because of the historic sites and monuments left by the Mughals and other great empires of the past. 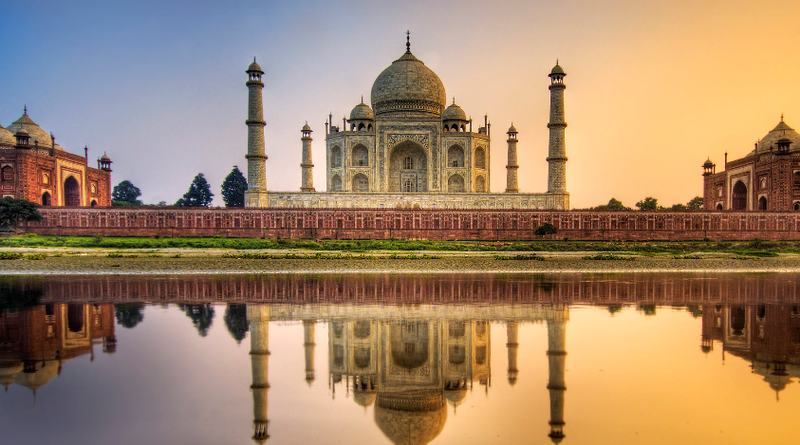 Agra is the garden of marbles and sandstone’s, which expresses love, romance and loyalty. No, Taj Mahal is not the only iconic attraction of the land. The entire region is filled with exceptional architectural beauty and this article pays importance to all unique monuments in and around Agra. Taj Mahal or the Crow of Palace was built in 17th century with marble, as a mausoleum for Shah Jahan’s favorite wife, Mumtaz Mahal. Taj Mahal includes the cemetery, museum, guesthouse, formal garden and fortified walls. This world heritage site is the icon of Mughal architecture and is one of the Seven Wonders of the World. It receives around 7-8 million tourists every year. Are you willing to cover Taj Mahal as the main attraction of your vacation? Visttnt has got your vacation covered. Here are the top suggested tour packages. The structure is built in ancient Persian and Mughal architecture. The inspiration came from a series of structures including Gur-e-Amir, Jama Masjid, Itmad-Ud-Daulah and others. The structure was built with white marbles and decorated with semi-precious stones. The main element of Taj Mahal is the tomb, which consist of arch doorway and symmetrical buildings. The main chamber of the structure holds false sarcophagi of Shah Jahan and his wife. The original grave is located exact under the fake one, in an underground chamber, which is closed to tourists. The minarets are around 40 feet tall and the top of the tower holds a balcony to get a panoramic view. The inner dome have inscriptions from Quran and you can find incised paintings, geometric patterns, carvings of flowers, fruits and others. Explore the complex for all three entrances. Stroll in the Persian garden. Explore the museum to spot ancient Mughal articles, coins, paintings, blueprints, royal items and so on. While exploring the Taj Mahal, spot pietra dura inlaid works and carved marble screens with lattice works. Do not miss the night tour, in which the complex is open for midnight viewers on full moon night and two nights before and after the full moon night. The mausoleum is not the only structure to explore in the complex. Other structures to cover are the assembly hall, mosque, bazaar streets and others. The East and the West Gate of the complex is open from sunrise to sunset. The South Gate opens at 8 in the morning and closes by 5 in the evening. The complex is closed on Fridays, except for those who visit the mosque for praying. For Indians – INR 250 per head from September 2018 (Source:). For children below age 15 – free of cost. 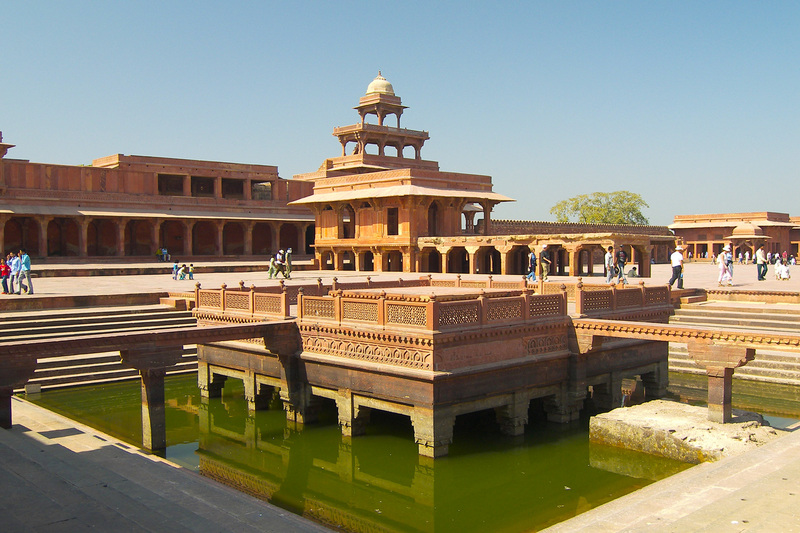 Located in a small town of Uttar Pradesh, the Fatehpur Sikri was built as a capital in 16th century by Akbar. After a decade or so, the emperor abandoned the new capital due to lack of water. This capital village gets its name from the village, which was present before the capital was built, Sikri. It is also said that his son, Jahangir was born in this village. Buland Darwaza – mosque with a victory arch, which reminds Akbar’s success in Gujarat campaign. 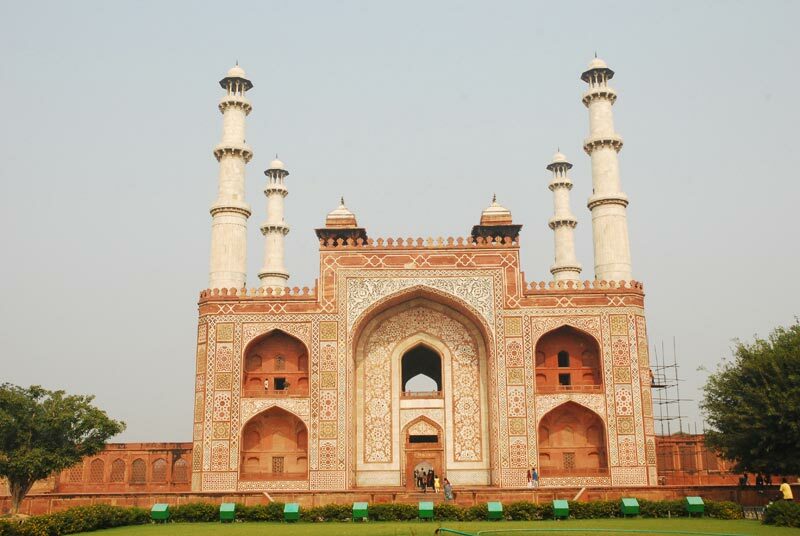 Jama Masjid – this is the first structure built in this city. This mosque opens to the courtyard and is famous for white marble inlay works. Tomb of Salim Chishti – this marble tomb of Salim Chishti was built on the grave of Sufi saint. It is made with jali decoration and you can find many other graves of male descendants of Salim Chishti. Diwan-i-Khas – the hall of private audience is a plain building with a large pillar in the center. The four stones on the gateway represents the four main religions of the land. Anup Talao – this ornamental pool was built with platforms and bridges. You can find many notable buildings around the pool. Mariam-uz-Zamani – this is the residence of Akbar’s Rajput wife, which has a great Gujarat influence and a large courtyard. Naubat Khana – this is the drum house, where musicians used drum to announce important news and arrival of emperor. Pachisi Court – this room has marking, which represent ludo game. People were used as playing piece. Panch Mahal – this five story tapering at the top. This was built for the women of the court. Birbal’s House – this house belonged to the minister of Akbar, Birbal. Hiran Minar – the elephant tower was erected as a memorial to the emperor’s favorite elephant. The capital is open from sunrise to sunset. The complex is closed on Fridays. This is a historic fort of the region and the second most important structure among tourists after Taj Mahal. Built in 17th century, this fort was used as the prime royal residence by Mughal emperors. It is more of a walled city than a mere fort. This heritage site belonged to Lodhi Dynasty before Mughal took over. After the fall of Mughals, Maratha emperor took over the fort and later handed over it to British government. Do you want to know more details about Agra Red Fort? 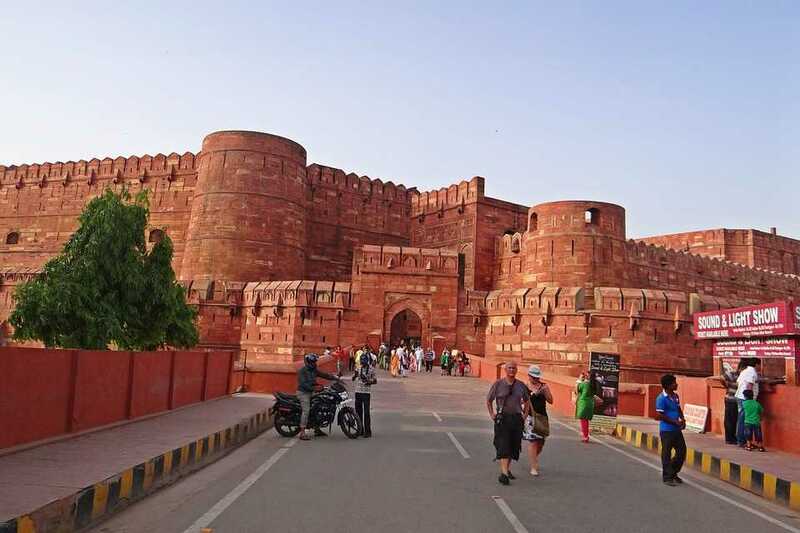 Read our exclusive blog: Ultimate Travel Guide to Agra Fort. This fort covers 94 acres of land, in a semicircular shaped layout. The borders are parallel to the river and it holds four gates, one on each side. The most notable gates of the fort are the Delhi Gate and Lahore Gate. The Delhi gate is famous for statues and carvings and was used to welcome kings after victory. Delhi Gate is not open to tourists. It is said that there were 500 buildings inside the fort, built with Gujarat and Bengal style. Later, Akbar’s grandson, Shah Jahan destroyed a large number of buildings to make way for marble structures of his choice. In 19th century, British destroyed many buildings to make way for barracks. Today, only 30 buildings survive. Khas Mahal – palace with grape garden, decorate windows, riverfront view, copper roof and much more. This was the residence of women of the court. Musamman Burj – this octagonal tower was the residence of two main queen (Nur Jahan and Mumtaz Mahal). The tower is famous for stone inlay works. Later, Shah Jahan was captured in this tower by his son and died here. Diwan-i-Khas – hall of private audience; building with marble columns, pietra dura decorations, marble thrones and a grand courtyard. A small mosque stands at the entrance of the hall. Diwan-i-Aam – hall of private audience; arched hall, famous for Peacock throne. Moti Masjid and other marble structures are found closer to this hall. Macchi Bhawan – this grand structure was used for harem functions. Sheesh Mahal – this glass palace has glasses for walls and it was the royal dressing room for the queens. Jama Masjid is the name given to numerous mosques built during Mughal regions. This Jama Masjid is located in Agra, right opposite to the Agra Fort. 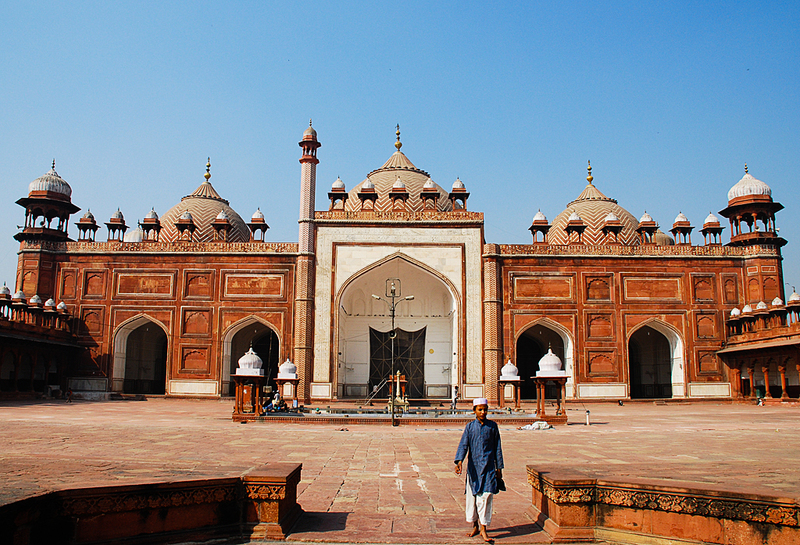 Jama Masjid is translated as Friday Mosque and it is one of the largest Islamic religious structures of the country. Do you want to cover Agra in a couple of days or just one day? 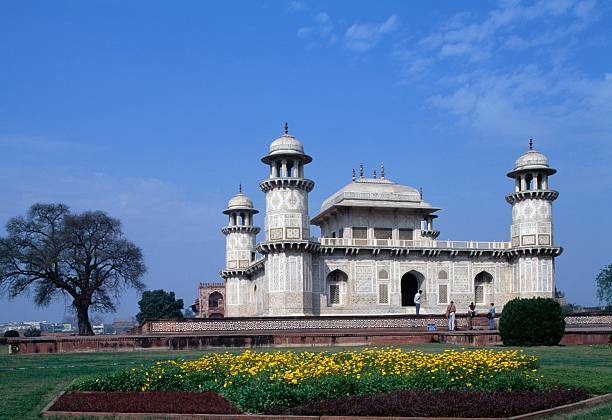 Here are the top short trip itineraries for Agra visitors. This mosque was built in Shah Jahan in 17th century. The mosque was dedicated to his favorite daughter, Jahanara. It is said the Tripolia Chowk was destroyed to make space for the mosque. The main entrance of the mosque is located on the eastern side, which leads to the prayer chambers. Bulbous domes with zigzag courses, white marble decorations and others. Persian inscriptions are made with black stones on white marbles. The central archway has praises of Shah Jahan and his daughter. The courtyard holds many pillars, fountains and four kiosks. The prayer wall has many decorations similar to Taj Mahal. You can find many paintings on the walls of the mosques. Open on all days, from sunrise to sunset. All religion tourists are allowed to visit the mosque. No entrance fee for the structure. Akbar’s tomb is the resting place of Akbar, the Great. This 17th century structure was built in an area covering 119 acres of land in Sikandra region. The tomb was massively destroyed during the reign of Aurangzeb by invaders. Later, British government reconstructed the tomb to the current structure. The tomb was built by Jahangir, son of Akbar. It is said that Akbar, himself chose the place for his burial. After his death, his son started the construction. Many years later, Jats ransacked the region, looted all the beautiful carpets, decorative structures and others. Later, the Jat king dragged the bones of Akbar from the tomb and burned the remains. The southern gate is the main entrance and is famous for minarets, which are similar to that of Taj Mahal. The tomb is a pyramid of four levels, mounted on a false tomb. Spot the red sandstone walls decorated with white marbles. You can find panel designs of calligraphic and floral styles. Visit the Lodi tomb inside the structure. Spot the ceiling paintings and carvings on the tomb. The garden around the tomb will be lush during winter and you can spot many deer, peacocks and monkeys. This is yet another mausoleum of Mughal reign, which is also called as the Baby Taj. This structure was built in 17th century with marbles and sandstone’s. The structure was built by Nur Jahan, wife of Jahangir, for her father, Mirza Ghuas Beg. It is said that Shah Jahan wanted to build something more beautiful and stunning that would overshadow the beauty of this structure and, thus built the Taj Mahal. Although commissioned for Mirza Ghiyas Beg, many of his relatives were also buried in this structure. Due to the lack of tourists and ignorance of importance to the intricate designs, the structure is rumbling to dust. Soon, the delicate designs will be destroyed to wear and tear. Thus, it is better to visit this structure as soon and possible. Located on the banks of River Yamuna, this structure is famous for garden with crisscross watercourses from the river. Each corner of the tomb holds a hexagonal tower of 13 meter. The walls of the structure are decorated with semi-precious stones like lapis, topaz, onyx, jasper and others. You can find paintings of wine bottles, cypress trees, fruit baskets, vases and others. Jali screen decoration is very common in this structure. For foreigners – INR 210 per head. Are you just spending less than a day in Agra? You can still cover all these heritage sites, with the itinerary proposed by read article: How to Spend a Day in Agra – Ideas and Itineraries. Why To Visit Agra ? Where to Go In India If You Want Skiing Attractions?